It’s also Murray’s only credit as director. Co-director, actually. His pal Howard Franklin had written the script and he was attached to star, but they couldn’t find someone to direct it, so they decided to do it themselves. Not surprisingly, they take few risks. In fact, the film looks and feels like so many other films of the period that, over time, it will likely become indistinguishable from them in my memory. It’s utterly mediocre, totally unmemorable, but passable entertainment for an hour and a half. It’s the sort of film a nine year-old boy might watch over and over again because it was the first film of its kind he’d seen, and maybe revisit for nostalgic purposes later in life (probably to be disappointed). Is that good enough? Is it okay for just that kid to get a real kick out of it? At least it isn’t a shameless, money-grabbing exercise, like a really bad sequel, or a film that coasts on the stature of its stars without making any effort to be good. Quick Change is far more noble than those films, because its agenda is simply to entertain you – it makes it a lot easier to forgive than if it had clearly been focused on your wallet. But look again at the picture above: it sums up the film, and those hundreds of other films like it. 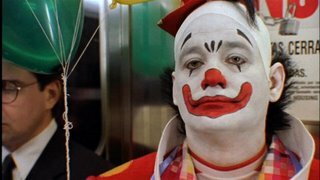 It’s Bill Murray, a big star whom millions of people love to watch, dressed up as a clown whose purpose it is to entertain. He’s not smiling. His heart isn’t in it. He’s put on all this makeup and silly clothes and said “Laugh at me”, but it’s hard for us to laugh because we can tell he isn’t really enjoying it himself. It’s not like he lacks sincerity, but he’s distracted, and we can see that. This isn’t to say Murray is bad. He’s the same as ever, which is fine, but it’s clear he doesn’t really believe in the material. The other actors are the same, going through the motions, except Randy Quaid whose hideous overacting can be painful. It’s work, a job to pay the bills in-between the good scripts they might sometimes be able to do. There are no behind the scenes interviews on this DVD, but if there were, I don’t think anyone from the cast or crew would be saying “As soon as I read the script I just had to do it”, or “My job is easy because the material is so good”; they’d be saying “I really admire my colleagues, and it’s a pleasure to work with them”. And, like the clown who isn’t smiling, we wouldn’t really believe them. Throw in a typically grating early 90s score, and you have a film that is average-to-poor in all respects. Reviews of such films are hardest, because there’s nothing to champion and nothing to rail against. They’re just there, and you’ve seen them, and you don’t care about them any more. I would recommend Quick Change only to Murray and Robards completists, but even those people will almost certainly get a greater kick out of watching Groundhog Day for the 37th time.